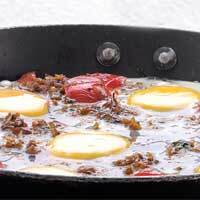 Baked eggs on tomato makes a substantial and decorative first course to a meal. 1 Boil tomatoes in 2 cups water a few minutes till tomatoes are slightly soft. 2 Remove tomatoes, cool then peel and chop roughly. 3 In a frying pan, heat the oil, then fry 1 finely sliced onion in it till golden. 4 Grind garlic and ginger to a paste, add to fried onion and cook 2 minutes. 5 Add turmeric powder, chilli powder, coriander and chopped onion and blend well. Cook 2 minutes. 6 Add tomato pulp and salt and cook, uncovered, till mixture is almost dry. 7 Add vinegar and sugar and continue cooking till liquid has almost evaporated. 8 Put tomato mixture into a pie plate and with the back of a spoon make 4 evenly spaced out hollows in the mixture. 9 Break an egg into each hollow, place in medium hot oven and bake till eggs are set.